Forgive my bluntness, but the fact that you’re on this page now tells me that your child has a problem with their times tables and you want to solve this problem FAST. I don’t want to waste your time and bore you with a long sales letter. Let’s get to the point shall we? I KNOW how to solve your child’s slow times tables problem. I’ve seen this problem many times before. I’ve been a High School math teacher, run an after school tuition center and have 4 children of my own, so I know how anxious you must be. 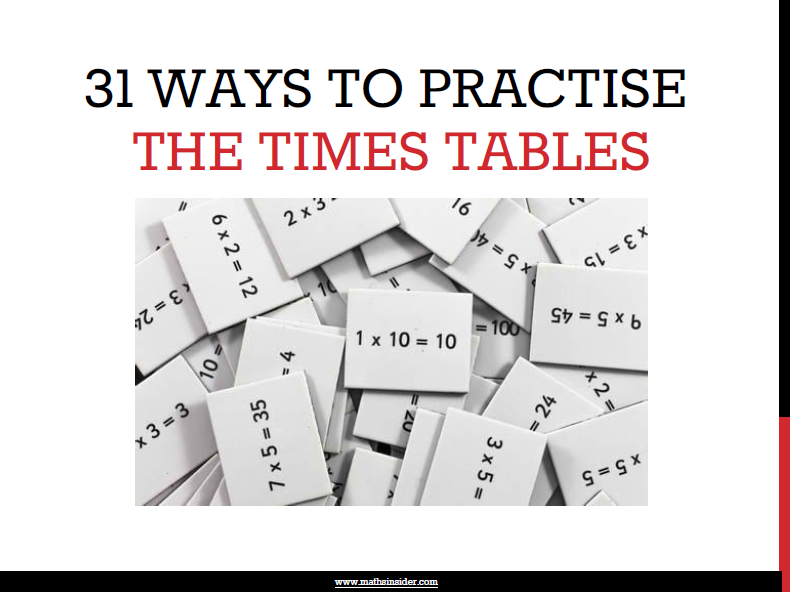 I’ve seen hundreds of parents who were frustrated as they could not find a PRACTICAL and FEASIBLE solution to help their child get faster at times tables. They searched everywhere and were even willing to pay high monthly fees to a tuition center in order to fix the problem. Why? Because information on how to help their children get faster at times tables was scattered here and there. How does digging through dozens of books, thousands of blogs and hundreds of forums sound? After countless hours and efforts spent helping children improve their times tables, I know which methods WORK and which ones don’t work. 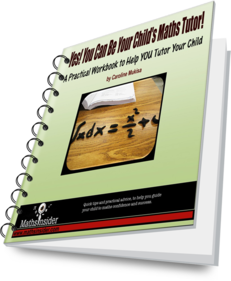 So I’ve pieced together the methods that WORK into ONE single location so that parents such as yourself, who have children whose times tables skills need improving, can really solve it once and for all. Tell you what. 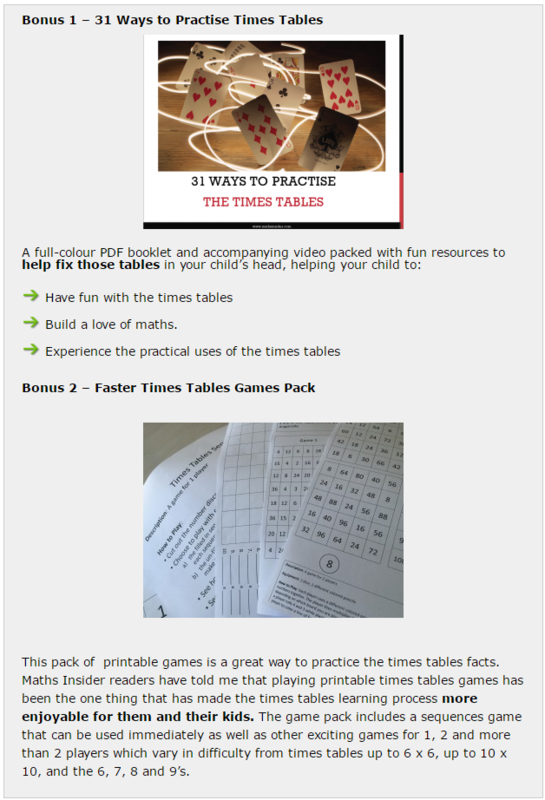 If you purchase 31 Days to Faster Times Tables now, I’ll throw in an extra bonuses that compliments the 31 Days to Faster Times Tables program to ensure your child enjoys practising their times tables. 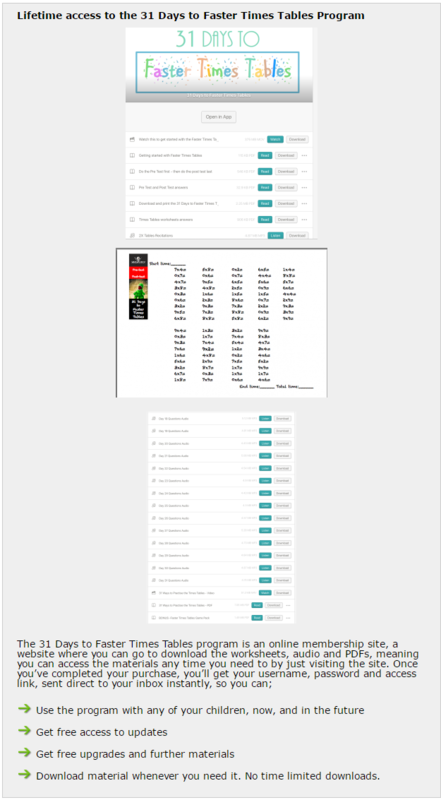 The value I’m offering you today for my 31 Days to Faster Times Tables package along with all the bonuses is really a no-brainer. 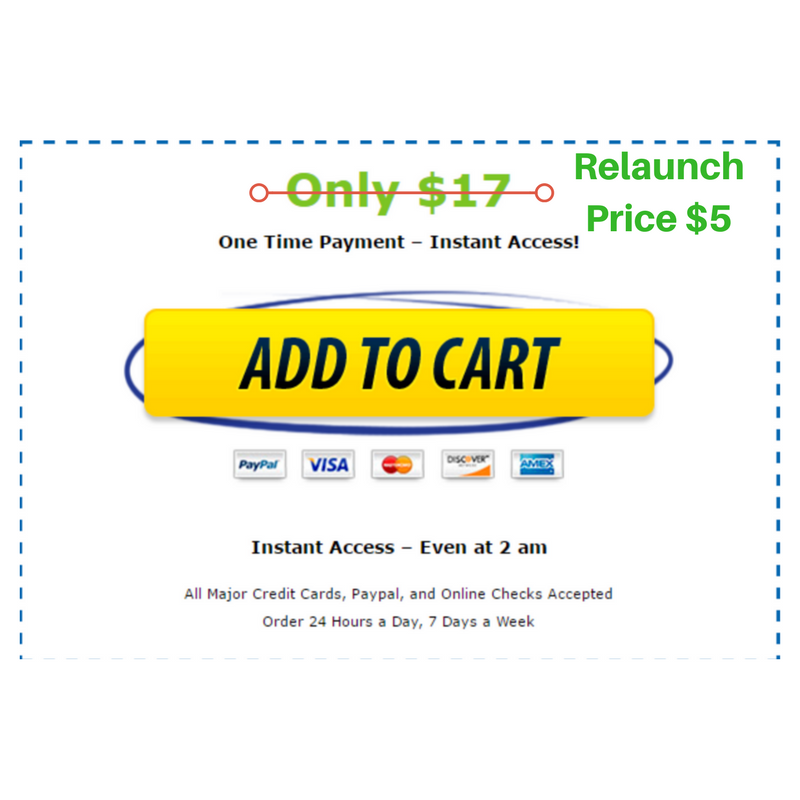 You could easily pay over $100 for a few hours with a maths tutor or a few sessions at a tuition centre But if you purchase today, you only need to come up with less than one-fifth of that price – which I’m sure you’d agree is a steal. PS. Remember, you’re covered by my “No-Questions-Asked” 100% Money Back Guarantee. All the risk is on me, and all the benefits are on you. If it turns out that you don’t like the 31 Days to Faster Times Tables program, simply contact me within 60 days at caroline@mathsinsider.com and I’ll promptly refund you in full. 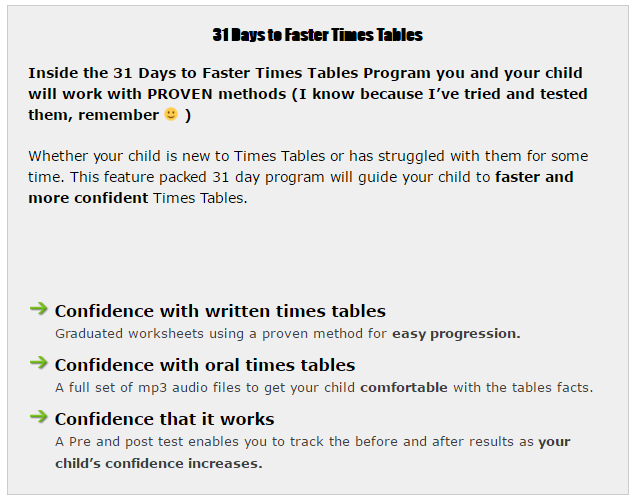 Help your child achieve more confident and faster times tables in 31 days by clicking the Add To Cart button above to get started immediately.